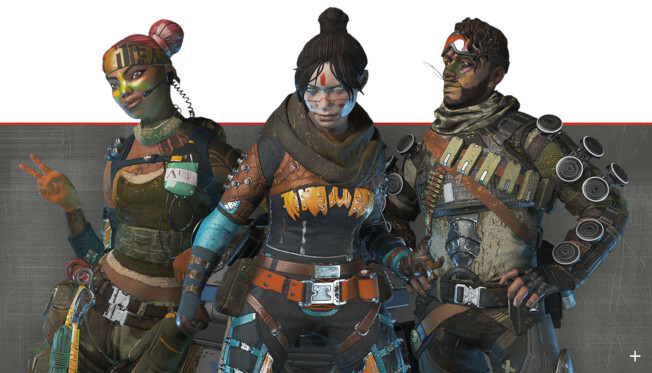 Apex Legends‘ first Battle Pass has arrived. The Season 1 Battle Pass, titled “Wild Frontier”, is being offered solo or as part of a bundle that unlocks the player’s next 25 levels instantly. Just keep in mind those 25 levels are going to cost you. The basic Battle Pass runs 950 Apex Coins while the bundle costs 2,800 Apex Coins. Purchasing either version will automatically unlock the Lifeline Revolutionary skin, the Wrath Survivor skin, and the Mirage Outlaw skin. It will also offer players a selection of free rewards — over 100 unique items to be exact. Don’t worry, even if you don’t purchase the Battle Pass, you can still get some goodies for participating in season one. These include a Wild Frontier Legend skin, 5 Apex packs, and 18 Wild Frontier Stat Trackers. Also of note in this update is the apparent introduction of Octane, the new character datamined a while back. He’s not specifically mentioned in the announcement, but there is an image of him there. To purchase the Battle Pass, simply hit up the in-game store.